As I’m sure you’ve heard by now, the big news coming out of the Academy Awards last night is the mixup regarding the Best Picture winner. Even without that, though, you probably wouldn’t have heard much about a nominated film that brought a bit of bioethics to the Oscars. Extremis, nominated for Best Documentary Short Subject, highlights the kinds of difficult decisions made every day in intensive care units, and emphasizes the important role of palliative care, especially at the end of life. The film follows Dr. Jessica Nutik Zitter, an ICU and palliative care specialist at Oakland’s Highland Hospital, as she counsels families facing agonizing choices about whether the treatments and interventions being performed are truly helpful. It is a truly complex film, not easy to categorize as either difficult or uplifting. It is very difficult to watch in parts. These families are suffering deeply. And it is beautifully uplifting in parts. The members of the medical team care deeply about not only the patients under their care but also about the families and friends of those patients. Dr. Zitter writes today in Time about the film, and about her goal of raising awareness of palliative care and countering the narrative that our only options are to make use of every treatment no matter how burdensome or suffer in intractable pain at the end of life. I’ve not seen Dr. Zitter address the physician-assisted suicide debate directly, but this is the same false narrative PAS advocates seize on in promoting their agenda. So I am glad to see this emphasis on palliative care and I’m thankful for whatever attention palliative care gains through this Oscar nomination. Importantly, though, Dr. Zitter emphasizes that we should not wait for end-of-life crises to arise to begin thinking about — and talking about — what we want as we approach death. To start to find a way to experience a better end, we need to reflect on our own deaths and begin the process of accepting our mortality. This may happen through meditation, writing, or conversations. Of course we should have hope if illness strikes us, but hope for perpetual life is blind. As we age or grow ill, the goal may switch from hope for longer life to hope for more attainable goals like healing relationships, living pain-free, and enjoying a glass of Cabernet. Simultaneously, we must prepare for this final stage of life. We must consider our preferences and values, and share them with our loved ones. Stephanie cared about being at home, with her family. What is most important to you? What would be most important to your loved ones? One day you might be called on to represent them. This conversation should happen repeatedly over the years, through the various stages of life and changes in health. A few months ago, I wrote briefly about hospice care, which is one very important aspect of palliative care. What I said then about hospice applies to palliative care in general. 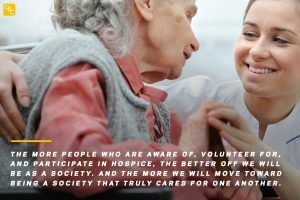 The more people who are aware of, volunteer for, and participate in hospice [and palliative care], the better off we will be as a society. And the more we will move toward being a society that truly cares for one another. Extremis is a very good film, and I commend it to you (it is available on Netflix). Watch it with your family, and discuss and reflect on it together. May it lead you into considering your preferences and values, and sharing them with your loved ones. It is not an easy film, but it is an important topic. I’m glad it was nominated for an Oscar. Too bad it didn’t win. This entry was posted in Blog and tagged End of Life, hospice, Palliative Care. Bookmark the permalink.